As we enter into spring, most colleges are nearing the last leg of the semester, and that means that summer vacation is quickly approaching. Staying focused throughout the school year can be challenging, but with the promise of warm days, sandy beaches, porches, lemonade, and a whole lot of relaxing, focusing on schoolwork all the way up until the final day can feel like a serious trial to overcome. But take heart! There are some specific strategies you can employ to try and keep yourself focused right up until the end of the quad. You can do this! 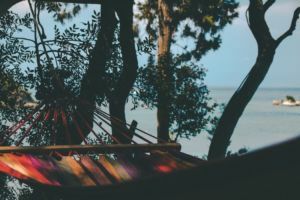 Sure, sure, you know that a long summer break is right around the corner, but dwelling on that factor might make things a lot harder for you throughout your normal classes and everyday happenings. It’s also tempting to let stress take the reigns and let that feeling of being overwhelmed completely overtake you. While the finals, papers, and projects that come at the end of a semester can be weighty, it’s a good idea to schedule out your time and take things day by day. Get yourself a planner and count back each day from when a project is due or test is to occur, and figure out how much time you will need to study, write, research, etc. Plan out each day so you know exactly what you’re supposed to be doing no matter what time it is—you should even plan out your rest and relaxation time! Once you’ve made a plan, you’ll be able to relax a bit, knowing that all the to-do’s swirling in your mind have a place to live. You can start living each day with a business-as-usual mindset. Hunker down, get the work done, make time for self-care, and finish off the semester the best you can! Having a bunch of big projects, papers, and tests coming at you all at once can feel really intense, but if you have something to look forward to on the other side of each one, it may ease the stress or motivation issues you’re feeling about your homework. You could schedule time for something small after each assignment you complete—for instance, you might allow yourself to watch one episode of a favorite show or take a quick walk around your dorm building after you complete the questions following a reading. Or you could plan an even bigger reward for yourself and arrange for a fun get together or even a trip with friends after all of your finals are complete. Having a reward on the other side of all the work can make pushing through the stressful times worth it. College is a really unique season of your life, and all those classes you’re attending and facts your learning are actually for a reason. You chose your major because you were interested in a certain subject matter, and all that studying and learning you’re doing is going to pay off in a positive way someday. You’re being educated so that you can succeed in your career later in life, and you’re also learning how to become a lifelong learner. Sometimes taking a moment to step back and remember why you’re even at college in the first place can be a helpful way to stay focused during the tough seasons. Write down some of your hopes and aspirations on 3×5 notecards and hang them on your bathroom mirror, or tape them to your steering wheel. Keeping your eye on the prize can be a great motivator in staying the course when writing that 18-page paper and studying for exams. Your friends care about you and are more than likely going through the same types of things as their semester also winds down. Ask your roommate to help hold you accountable in your study habits, or ask your friends to pray for you before that big final. Study groups are also a wonderful way to get some hard work done in a fun setting without feeling like you have to isolate yourself for hours. The beauty of being at a college is there are a whole lot of people going through the same tough times as you—connect with others and carry the load together!